1. Combine your water and sugar in a medium heavy-bottomed pot. Heat on medium-high heat until sugar dissolves, stir occasionally. 2. Bring to a boil, allow the syrup to boil for about 5-7 minutes. 3. Remove from heat after syrup thickens slightly and add your lemon juice and waters. 4. Pour into a glass container add a small sliver of lemon to store in the syrup. Once cooled to room temperature, store in refrigerator. 5. Syrup lasts many months in the fridge and can be used on many desserts. 2. In a small saucepan, melt butter over medium-high heat. 3. Continue to cook over medium-high heat; an even layer of white milk proteins will float to the surface. 4. Bring to a boil; the milk proteins will become foamy. 5. Lower heat to medium and continue to gently boil; the milk proteins will break apart. 6. As the butter gently boils, the milk proteins will eventually sink to the bottom of the pot, and the boiling will begin to calm and then cease. 7. Once boiling has stopped, pour butter through a cheesecloth-lined strainer or through a coffee filter into a heatproof container to remove browned milk solids. Let cool, then transfer to a sealed container and refrigerate until ready to use. Clarified butter should keep for at least 6 months in the refrigerator. 1. Thaw your phyllo dough according to the package instructions. 2. Preheat oven to 325 degrees Fahrenheit. 3. In the bowl of a food processor, combine your walnuts + sugar and pulse until the nuts and sugar are combine and the nuts are small fine crumbles. Add a splash of rose and orange blossom waters (about 1/2 tsp of each). 4. 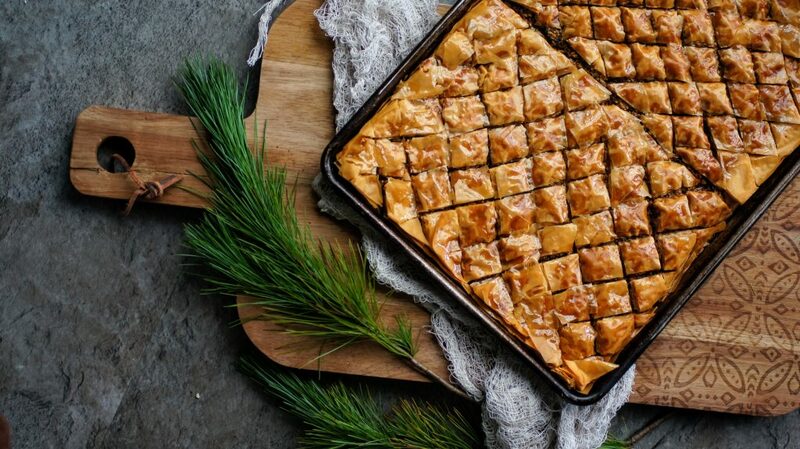 Begin assembling your baklawa by coating the bottom of a half sheet pan with your clarified butter. Be sure to also coat the sides. 5. Take about 10 sheets of your phyllo dough and lay flat on the buttered sheet pan. 6. Spread your walnut mixture evenly across the phyllo. 7. Drizzle about 2 tablespoons of butter on top of your walnuts. 8. Begin layering your phyllo dough. Remove about 2 sheets, lay on top of walnuts, brush lightly with butter. 9. Repeat the above steps until you have finished your phyllo dough. DON'T coat the top coat with butter YET. 10. After your final layer, begin cutting your dessert. With a sharp knife, begin making diagonal lines across evenly. Make sure to press down to cut through to the bottom. 12. Finally drizzle about 2 tablespoons of butter on the top and brush lightly. 13. Place in preheated oven and bake for 30 minutes. 14. After 30 minutes, reduce oven temperature to 225 degrees Fahrenheit and bake for an additional 20-30 minutes. Be sure to check so it doesn't brown too much. Ovens vary in temperature. 15. Once top is golden and flaky, remove from oven. 16. While batlawa is still HOT, pour your attar syrup on top. You'll use about 1-1.5 cups. Drizzle starting from one end and work down to the other end until the batlawa is coated and absorbs the syrup. 17. Let cool, remove pieces and enjoy! **You can make the attar syrup and clarified butter ahead and store in fridge until ready to use. Melt butter before using.